The powertrain that currently lives in Porsche’s Panamera Turbo S E-Hybrid (a 4.0-liter twin turbocharged hybrid V8) will soon be added to the Cayenne range, EVO has learned in an interview with Porsche boss Oliver Blume. He didn’t mention a specific power output, but we can probably expect something similar to the Panamera’s figures, which are 671 HP and 627 lb-ft of torque combined. 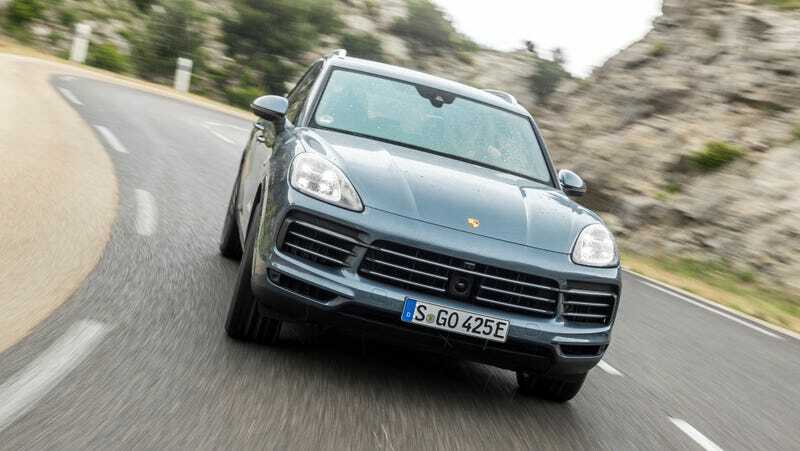 It’s only 20 or so horsepower, but that still means the new Cayenne would make more power than the 650-horse Urus. Will the Urus go hybrid in response? Who knows! It’s not like Porsche and Lamborghini have ever competed with each other before. Of course, the Jeep Grand Cherokee Trackhawk is still sitting high and mighty at 707 horsepower. That one’s got everyone beat. Yeah, America! Porsche hasn’t officially announced anything about the Cayenne Turbo S E-Hybrid yet, but you’ll probably see it at one of the upcoming auto shows this year. Be ready for it.